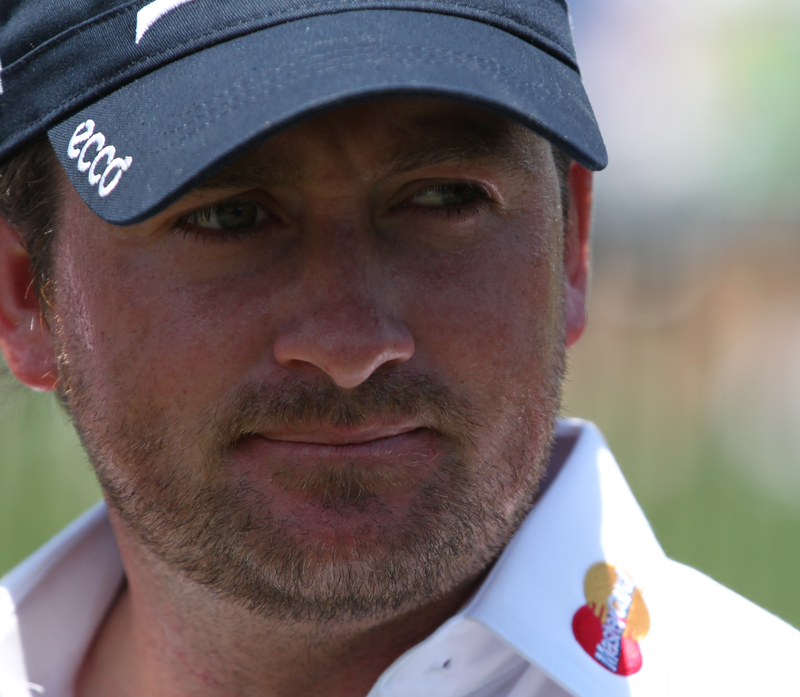 Graeme McDowell needed an extra hole to do it, but he came away victorious at the 2013 RBC Heritage, defeating reigning U.S. Open champion Webb Simpson at Harbour Town. Heavy winds, as is customary at Harbour Town, made a major impact on the field on Sunday as only six of the tournament’s top-24 finishers were under par. McDowell entered Sunday’s final round four shots back of leader Charley Hoffman, and didn’t really make much of a charge, playing a steady front nine and making the turn in 1-under par. Two birdies on the back nine gave McDowell a one-shot lead on Simpson as he got to the 18th, while Hoffman struggled to stay at the top of the board. After McDowell’s approach fell just over the green on 18, he blew his birdie putt by the hole and missed the par putt coming back. McDowell tapped in for bogey, while Simpson made par to send the players back to the 18th tee. Both players found the fairway, with Simpson away and playing first. His approach went right of the green, giving McDowell an opening which he took advantage of, landing his approach below the hole. Simpson got a little unlucky on his putt from off the green when a gust of wind sent his ball eight feet past the hole, and after McDowell two-putted for par, Simpson needed to make to force another hole. When his comebacker when past the hole, McDowell had his first win since the 2010 Andalucia Valderrama Masters. Thanks to his win at Pebble Beach in the 2010 U.S. Open, McDowell is still okay as far as his exemptions go, but two-and-a-half years is far too long for a player of McDowell’s quality to go between wins. When I suggested him as a play in my betting preview, I thought that his game matched up really well with the course based on his ability to hit tons of fairways, and obviously that was the case. It always feels great for a player to get back into the winner’s circle, but I never get the impression that McDowell feels any kind of pressure to go out there and win tournaments. He just seems like the type of player that doesn’t get overly frustrated or worried about poor results, but obviously the win feels good. On another note for the tournament, the tradition continues for major winners having success at Harbour Town. It’s a tough track that generally produces a quality winner, and they have another one in Graeme McDowell. The Heritage is always one of my favourite stops on the PGA Tour, and it has everything to do with the style of Harbour Town. The design by Dye and Nicklaus shows that a course doesn’t have to be ridiculously long to still be playable and difficult on the PGA Tour. Of course, the wind plays a big part in that, but tight fairways, small greens and perfectly placed bunkers and doglegs make it a course that requires a lot of thinking, rather than just going out there and trying to hit it as far as possible. If Merion is able to host a U.S. Open this year, I’d like to think that Harbour Town could be a major site in the future as well. The field bloated to 91 players, tying the PGA Tour record set at the 1981 Travelers Championship, prompting the second cut after Saturday’s round. 21 players, Parnevik included, ended up with an MDF status and did not get to play in Sunday’s final round. The honour this week belongs to Tag Ridings who missed the cut after a round of 72 on Friday. Unfortunately for him, he shot an 85 on Thursday, with no birdies on his card at all. Seven pars and eleven bogeys or worse add up to an awful day, but at least he was consistent on both nines, firing a 42 and 43 on each side. Speaking from experience, there’s little worse than having a ten shot gap between nines. Notable players to miss the cut: Vijay Singh, Kyle Stanley, Ernie Els, Charles Howell III, Erik Compton, Michael Thompson, Bud Cauley, Seung-yul Noh and John Daly. France’s Ralphael Jacquelin won the European Tour’s Open de Espana today in Spain on the ninth playoff hole, defeating Felipe Aguilar and Maximillian Keifer. Tough way to end for Marc Warren, who led most of the day but bogeyed four of his final five holes to miss out on the playoff by one stroke. After the horrible Boston Marathon bombing this week, Boston native James Driscoll decided to donate money to the cause. For every birdie made, Driscoll would donate $1,000 to One Fund Boston, a charity to help the victims of the bombings. With nine birdies made this week, he was able to donate $9,000. Good finishes for both Luke Donald and Simpson this week, who haven’t had the best seasons to date. The same goes for Camilo Villegas who picked up his first top-10 finish in a stroke play event since October 2011 at the Asia Pacific Classic. GIFs of the tournament are on the way.